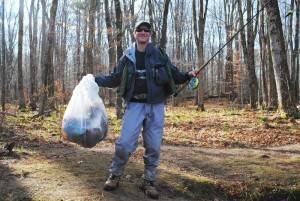 ALTMAR, NY – A group of dedicated anglers will return to the Salmon River on May 7 – not to fish, but to pick up trash and debris – for their second annual Salmon River Cleanup. The Lake Ontario Tributary Anglers Council will meet at 10 a.m. at Fox Hollow Lodge, 2740 State Route 13. Volunteers will receive trash bags and gloves and disperse in teams to pick up trash along the river. All trash will be collected in a utility trailer at the boat launch parking lot off County Route 2A near Pulaski. LOTAC members will meet back at Fox Hollow at 3 p.m. for food provided by the lodge and raffles of donated gear and tackle. Refreshments will be $6 per person.